Lead Sales Consultants supervise and oversee the daily sales operations and merchandising activities of an organization. The role of a lead sales consultant is elaborate as these consultants not only generate sales but also assist the store manager and direct the sales staff. 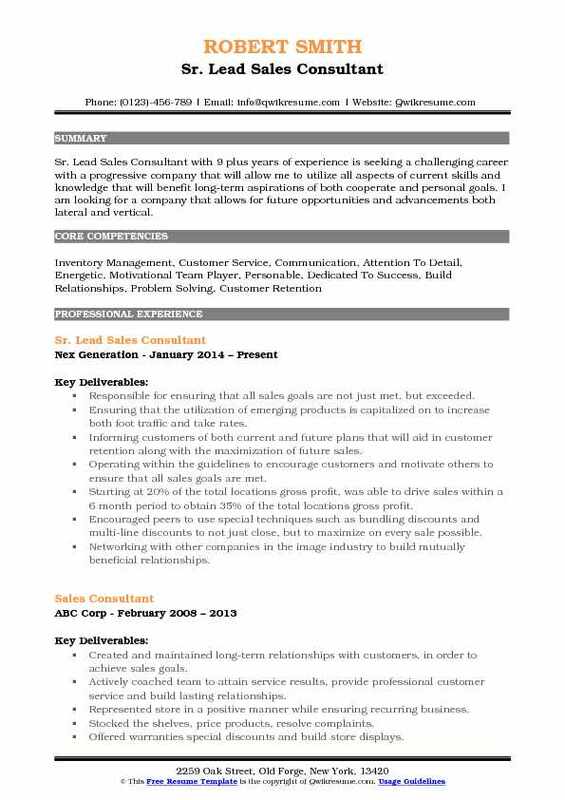 The job description of the Lead Sales Consultant Resume consists of – identifying appropriate customers, making lead sales calls, promoting products as a way to enhance sales prospects, handling customer queries, resolving issues and explaining features and details of the product to customers. 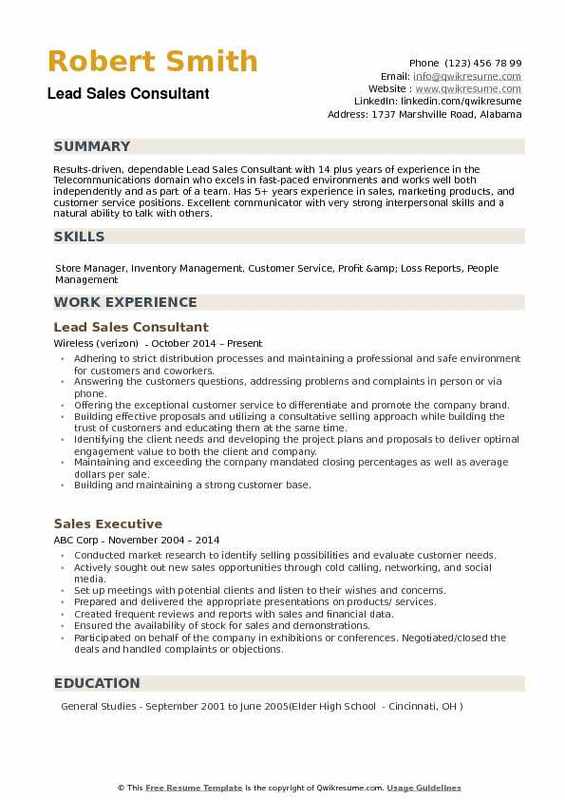 To take this challenging role, candidates have to depict in their resume qualifications such as – mathematical skills, versatile experience in handling cash and customers, interpersonal skills, safety policies and practices knowledge, telephone etiquette, and the ability to direct and motivate juniors. Lead sales consultants come from varying educational backgrounds, but major of these candidates have at least a high school diploma with years of experience in the sales platform. Objective : Skilled, reliable, ambitious Junior Lead Sales Consultant with 2 plus years of experience in the Sales domain who is highly qualified in service-based positions requiring an emphasis on client satisfaction in a fast-paced environment. Very articulate in both oral and written communication. An assertive team player who is willing and able to embrace new challenges and eager to put learned skills to practical use. Leading a team of sales consultant in exceeding monthly and quarterly sales goals. Understanding cars by studying their features and capabilities, as well as comparing and contrasting competitive models. Developing buyers by keeping a good rapport with previous and new customers; also by suggesting trade-ins. Responding to inquiries, recommending the sales campaigns and promotions. Qualifying buyers by understanding their interests and requirements, matching requirements and interests to various models, etc. Closing sales by overcoming objection(s), completing the sales or purchase contracts, explaining provisions, offering services, warranties, and financing. Collecting the payment and delivering the automobile. Figuring out customers needs by listening and asking questions to understand their needs. Performing walk-around with the new and old customer and demonstrating features of suitable vehicles. Ensuring that customers understand the vehicles operating features, paperwork and warranty. 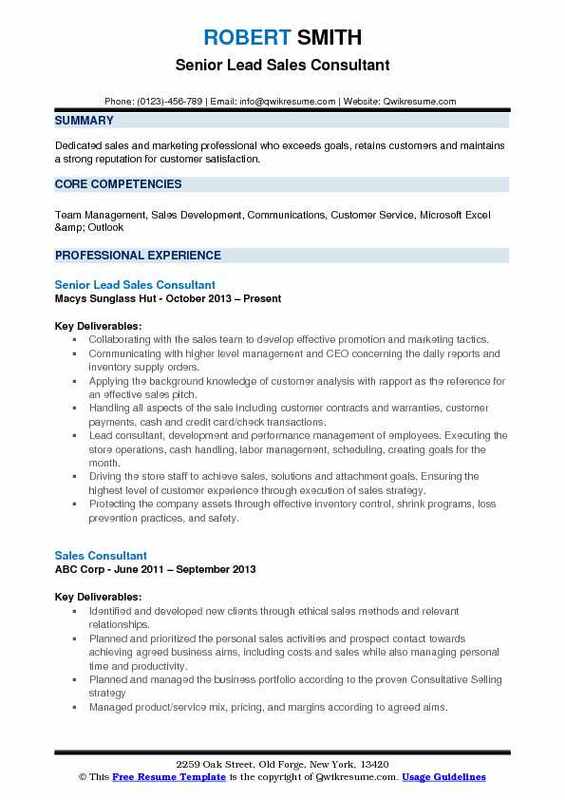 Summary : Dedicated sales and marketing professional who exceeds goals, retains customers and maintains a strong reputation for customer satisfaction. Collaborating with the sales team to develop effective promotion and marketing tactics. Communicating with higher level management and CEO concerning the daily reports and inventory supply orders. Applying the background knowledge of customer analysis with rapport as the reference for an effective sales pitch. Handling all aspects of the sale including customer contracts and warranties, customer payments, cash and credit card/check transactions. Lead consultant, development and performance management of employees. Executing the store operations, cash handling, labor management, scheduling, creating goals for the month. Driving the store staff to achieve sales, solutions and attachment goals. Ensuring the highest level of customer experience through execution of sales strategy. Protecting the company assets through effective inventory control, shrink programs, loss prevention practices, and safety. 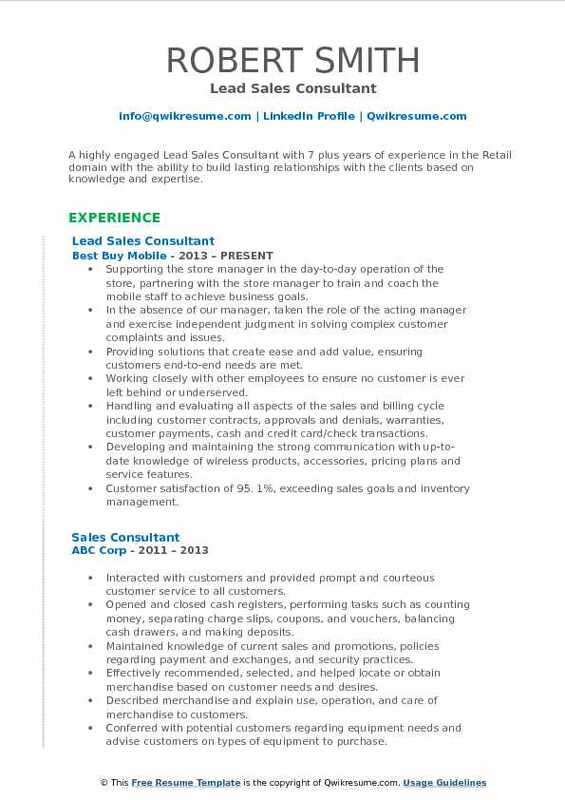 Summary : Lead Sales Consultant I with over 10 plus years of customer service and sales experience. Highly motivated and passionate about customer satisfaction and company growth. Experienced in providing existing customers with new services and promotions. Self-motivated with exceptional communication and computer abilities with a background in the wireless communication and home services. Maintained the store's integrity while dealing with confidential information of our valued customers. Completed full audits, which were submitted weekly by the assigned manager. Performed necessary calculations to provide the best-priced services for customers. Completed bi-weekly time revisions and assisted with district time revision at the La Jolla location. Assisted in training wireless consultants and new managers in whats expected operationally. Assisted customers with their business and personal needs, to guarantee full satisfaction with Verizon wireless. Developed, maintained and communicated strong, up-to-date knowledge of wireless products, accessories, pricing plans and service features. 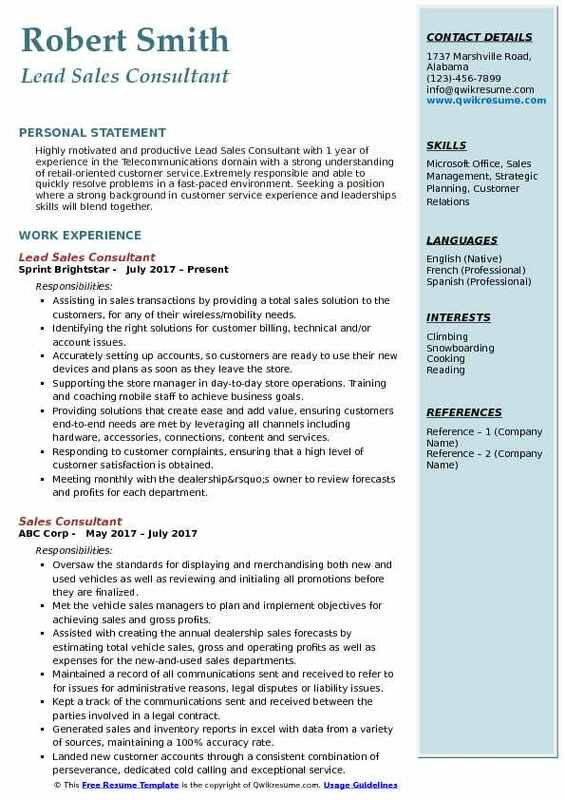 Summary : A highly engaged Lead Sales Consultant with 7 plus years of experience in the Retail domain with the ability to build lasting relationships with the clients based on knowledge and expertise. Supporting the store manager in the day-to-day operation of the store, partnering with the store manager to train and coach the mobile staff to achieve business goals. In the absence of our manager, taken the role of the acting manager and exercise independent judgment in solving complex customer complaints and issues. Providing solutions that create ease and add value, ensuring customers end-to-end needs are met. Working closely with other employees to ensure no customer is ever left behind or underserved. Handling and evaluating all aspects of the sales and billing cycle including customer contracts, approvals and denials, warranties, customer payments, cash and credit card/check transactions. Developing and maintaining the strong communication with up-to-date knowledge of wireless products, accessories, pricing plans and service features. Customer satisfaction of 95. 1%, exceeding sales goals and inventory management. Objective : Highly motivated and productive Lead Sales Consultant with 1 year of experience in the Telecommunications domain with a strong understanding of retail-oriented customer service.Extremely responsible and able to quickly resolve problems in a fast-paced environment. Seeking a position where a strong background in customer service experience and leaderships skills will blend together. Assisting in sales transactions by providing a total sales solution to the customers, for any of their wireless/mobility needs. Identifying the right solutions for customer billing, technical and/or account issues. Accurately setting up accounts, so customers are ready to use their new devices and plans as soon as they leave the store. Supporting the store manager in day-to-day store operations. Training and coaching mobile staff to achieve business goals. Providing solutions that create ease and add value, ensuring customers end-to-end needs are met by leveraging all channels including hardware, accessories, connections, content and services. Responding to customer complaints, ensuring that a high level of customer satisfaction is obtained. Meeting monthly with the dealership’s owner to review forecasts and profits for each department. 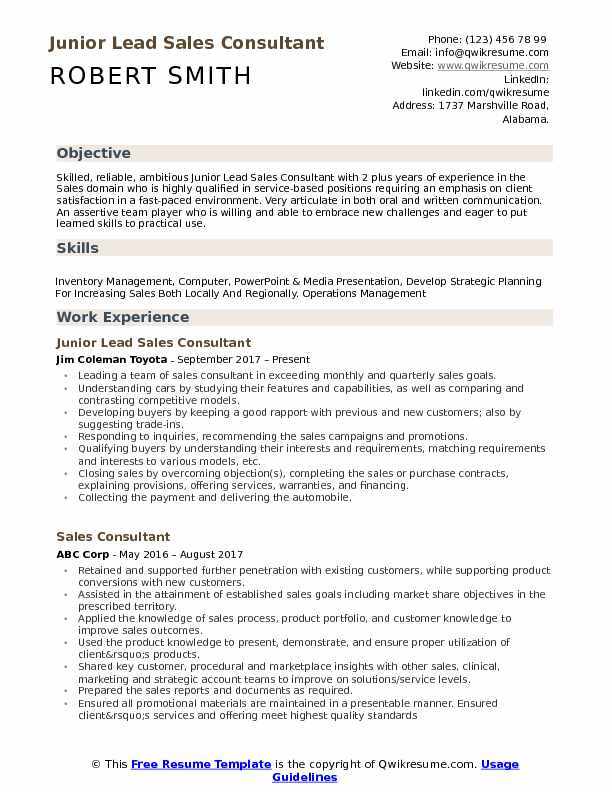 Objective : Lead Sales Consultant with 3 plus years of experience in the Automobiles domain, who is seeking a challenging and interesting position and start my career with a company in the car/sales consultant industry where room for advancement is possible. Understanding the automobiles by studying characteristics, capabilities, and features, comparing and contrasting competitive models and inspecting automobiles. Developing the buyers by maintaining rapport with previous customers, suggesting trade-ins, meeting prospects at community activities, greeting drop-ins, responding to inquiries, recommending sales campaigns and promotions. Qualifying the buyers by understanding buyers requirements and interests, matching the requirements and interests to various models and building rapport. Demonstrating the automobiles by explaining characteristics, capabilities, and features and taking drives. Closing the sales by overcoming objections, asking for sales, negotiating price and completing sales or purchase contracts. Explaining provisions, explaining and offering warranties, services, and financing, collecting payment. Updating the job knowledge by participating in educational opportunities and reading professional publications. Enhancing the dealership reputation by accepting ownership for accomplishing new and different requests. Summary : Self-driven, high-energy Lead Sales Consultant II with 15 years of experience in the Telecommunications domain who achieves department and corporate objectives by converting obstacles into opportunities through creative selling. Self-directed and result drove while promoting a positive environment and teamwork through daily interactions. Team builder who enhances employee engagement for enhanced sales improvement. Prospecting the new business development through face-to-face interaction and referrals. Educating the prospective customers on technology advancement and position product value to personal or business needs. Proposing Sprint wireless products and services to maximize efficiency and exceed the expectations of the client. Providing the daily account management including upsell, billing and technical support. Obtained Apple master in my division by completing the Apple Master Program set forth by Apple. 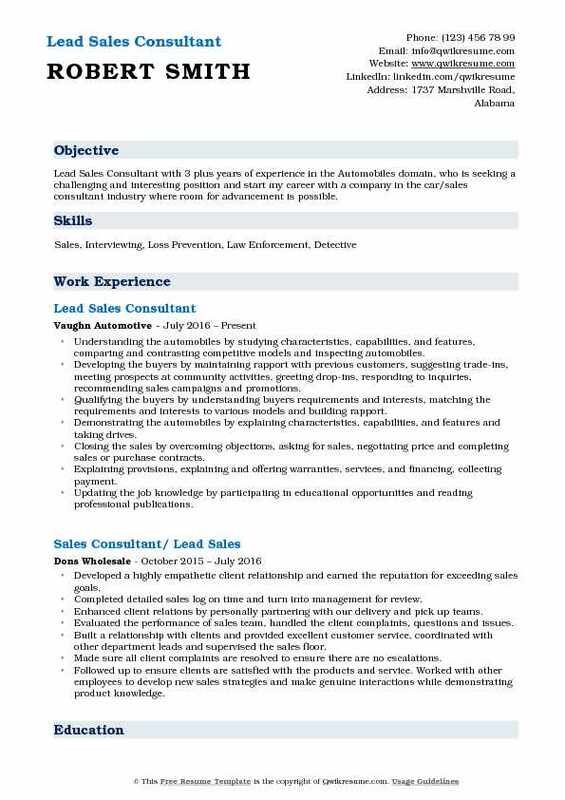 Obtaining lead sales consultant role within our division for personal or business sales. Partnering with store leadership and regional sales trainer to act as a mentor towards new sellers and educate new employees on the product, pricing, and systems. Working collaboratively with leadership to develop and revise sales flow, role-playing scenarios and product knowledge to increase upsell opportunities for sales teams. Aquire a minimum individual closing ratio of at least 50% face to face and 60% overall. 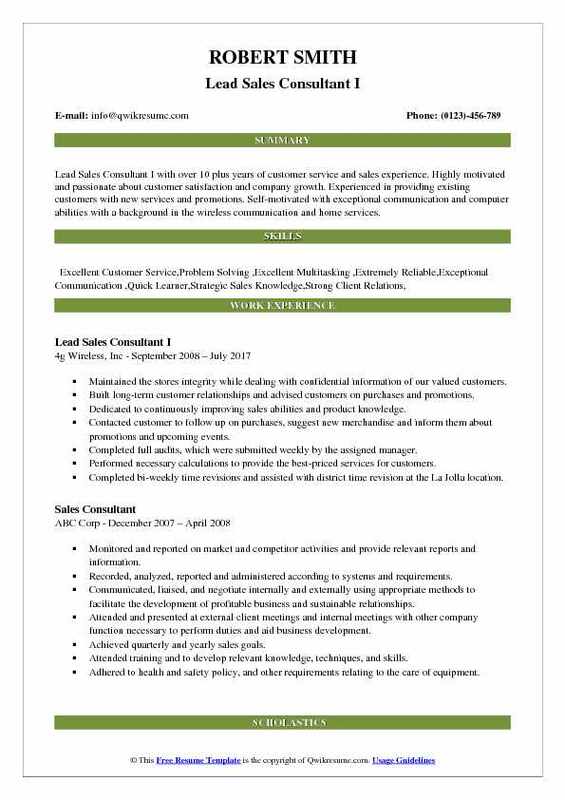 Summary : Sr. Lead Sales Consultant with 9 plus years of experience is seeking a challenging career with a progressive company that will allow me to utilize all aspects of current skills and knowledge that will benefit long-term aspirations of both cooperate and personal goals. I am looking for a company that allows for future opportunities and advancements both lateral and vertical. Responsible for ensuring that all sales goals are not just met, but exceeded. Ensuring that the utilization of emerging products is capitalized on to increase both foot traffic and take rates. Informing customers of both current and future plans that will aid in customer retention along with the maximization of future sales. Operating within the guidelines to encourage customers and motivate others to ensure that all sales goals are met. Starting at 20% of the total locations gross profit, was able to drive sales within a 6 month period to obtain 35% of the total locations gross profit. Encouraged peers to use special techniques such as bundling discounts and multi-line discounts to not just close, but to maximize on every sale possible. Networking with other companies in the image industry to build mutually beneficial relationships. Following up with previous visitors to renew their interest and existing guests who mentioned adding additional areas. Selling the value of the services to the guests when they visit the center during consultations. Summary : Lead Sales Consultant IV with 25 years of experience is seeking to secure employment requiring the use of my extensive people skills and the art of negotiation. 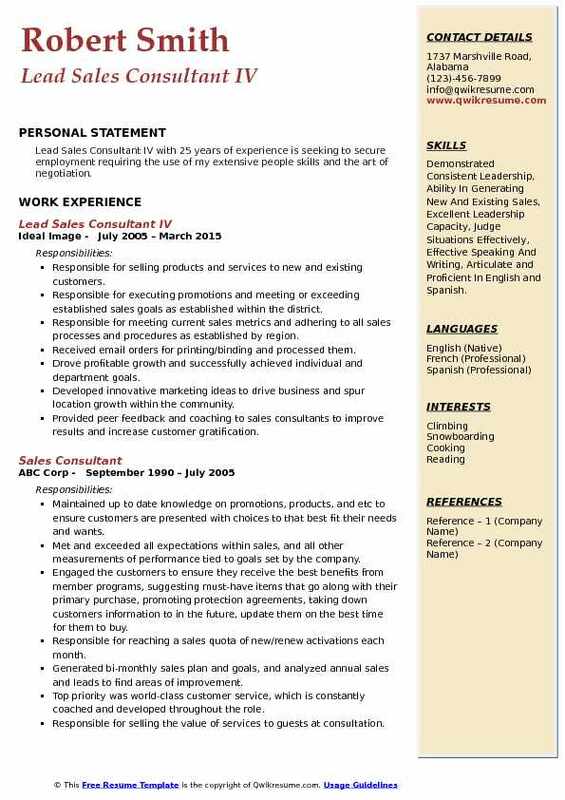 Skills : Demonstrated Consistent Leadership, Ability In Generating New And Existing Sales, Excellent Leadership Capacity, Judge Situations Effectively, Effective Speaking And Writing, Articulate and Proficient In English and Spanish. Responsible for selling products and services to new and existing customers. Responsible for executing promotions and meeting or exceeding established sales goals as established within the district. Responsible for meeting current sales metrics and adhering to all sales processes and procedures as established by region. Received email orders for printing/binding and processed them. Drove profitable growth and successfully achieved individual and department goals. Developed innovative marketing ideas to drive business and spur location growth within the community. Provided peer feedback and coaching to sales consultants to improve results and increase customer gratification. Ran a daily schedule of guest consultations, meeting with each guest, discussing their individual needs, explaining the treatment procedure and developing a package that effectively meets those needs. Drove revenue daily by overcoming objections and closing sales to meet and exceed sales targets. Established rapport with guests and gain customer referral business as well as bring my own self-driven leads into the center for consultations. Summary : Results-driven, dependable Lead Sales Consultant with 14 plus years of experience in the Telecommunications domain who excels in fast-paced environments and works well both independently and as part of a team. 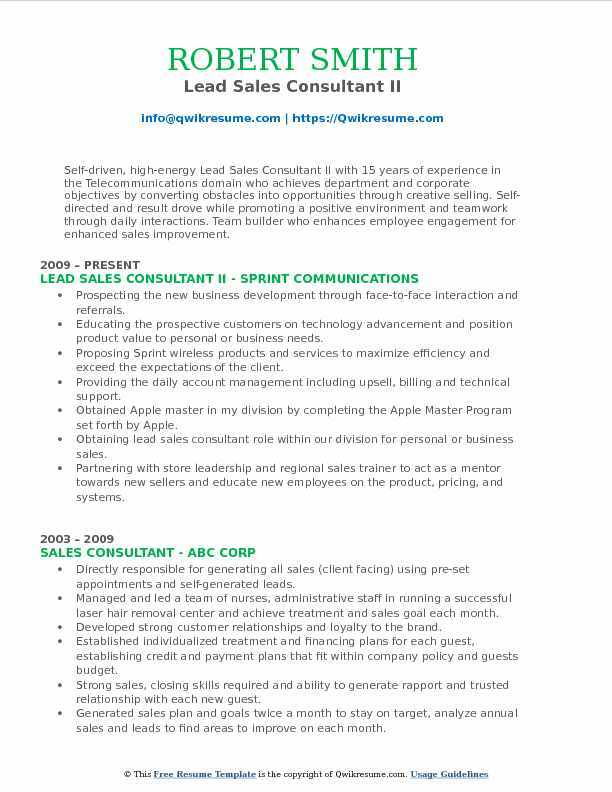 Has 5+ years experience in sales, marketing products, and customer service positions. Excellent communicator with very strong interpersonal skills and a natural ability to talk with others. Adhering to strict distribution processes and maintaining a professional and safe environment for customers and coworkers. Answering the customers' questions, addressing problems and complaints in person or via phone. Offering the exceptional customer service to differentiate and promote the company brand. Building effective proposals and utilizing a consultative selling approach while building the trust of customers and educating them at the same time. Identifying the client needs and developing the project plans and proposals to deliver optimal engagement value to both the client and company. Maintaining and exceeding the company mandated closing percentages as well as average dollars per sale. Building and maintaining a strong customer base. Building sales through some prospecting, following up and some marketing. Exceeding the stated monthly sales goals. An adaptive work environment that allows for constant learning of new devices and information about the mobile services industry.